Don’t let someone convince you that you need to tear out perfectly good areas of your kitchen to give it a rustic country vibe. What you have now will be the best indicator of what you can use to improve your kitchen decor without killing your budget. Start with your wants and needs list and a healthy idea of your budget. Do not limit yourself to what is available in the big box stores. Think creatively, think old world, think European. If you need an entire kitchen remodel than the rustic world is your oyster. 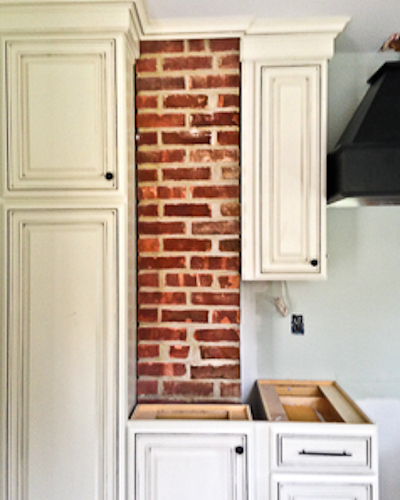 Exposed brick and any stone masonry should be completed by a well-qualified professional. DO NOT let just anyone do this type of work in such a highly visible area of your home. It is much cheaper to have it done correctly the first time than to have it done, ripped out, and then redone. If an entire remodel is not necessary, or not in the budget, you’ll want to look at the areas most in need of updating. Let’s start from the bottom and go up. Kitchen Flooring: Rustic flooring options run the gamut from reclaimed wood, hand thrown tile, brick and stone masonary products. In our area there is an abundance of bluestone. Do not hesitate to have us price a bluestone slab for you. It may or may not be a workable option for your particular kitchen but it is good to know it is out there. Kitchen Walls: Wainscoting created with reclaimed wood, barn doors, and even pallets are wonderful ideas. Whether painted or stained they are an immediate hit. Brick and stone wall coverings give you great options as well as high end appeal. If you’d like to go with tile you need to pick a tile that is not to manufactured looking but also blends with your existing decor. Kitchen Islands and Kitchen Tables: Custom islands and tables are great items to look at to incorporate a rustic flare. A well-crafted item will include both existing material and new material to give the impression that it was part of the original kitchen design. Kitchen Countertops: A huge variety of materials are available for kitchen countertops. While most kitchen remodelers will go with the run of the mill options a professional stone mason will be where you will want to go for high impact distinctive stone countertops. Concrete countertops are another amazing option and can literally be incorporated into any existing design with the use of stains, sealers, and exposed aggregate. Wooden countertops are surprisingly rare in our area since giving way to cheaper options decades ago. If wood is an option for you always consider it. It packs a punch only rivalled by custom stone and can be incorporated with inlaid stone or brick to become a work of art. Tile is exceptional in that you can use stone, brick, porcelain, etc. tiles to make your countertops breathlessly beautiful. Another perk is that, like wood, this is the type of project that is easier on the home owner who still requires the use of the kitchen during the course of the project. Only high end Tile Contractors can give you a high end look. Anything else will likely be a reflection of the investment. Kitchen Cabinets: Wood had long been the go to choice for cabinetry. There is no need to replace solid wood cabinets. If your kitchen cabinets are not living up to your desired rustic feel then simply changing the face is often the way to go. Like everything else this can be very a dramatic or a very subtle change. The hardware is a great DIY place to consider. Hunt down some beautiful hinges and knobs in high end online stores. Again, don’t limit yourself to the big box options. It is not terribly costly to ship a lot of cabinet hardware. Painting and staining is also a great DIY kitchen upgrade. Do not be shy about this but do consider if it is in your best interest to complete those project tasks prior to most every other work. It will be less stressful on the DIYer if they are not concerned about dripping onto new flooring. Chicken wire and lit glass cabinet doors do amazing things on tight budgets. They can also lighten up the feel of an area that you may be concerned is getting to heavy with more solid materials. Kitchen Sinks: If your kitchen sink has seen better days you can very frugally start there. Antique shops often have inexpensive and unique sinks available. It may require a little hunting but they are out there. One nice aspect of ‘rustic’ is that bumps and chips are more of a character trait than a flaw. Stone and metal farmhouse sinks are gorgeous but often cruelly expensive. A wonderful alternative is a custom concrete sink and/or upgrading the fixtures. Keep it modern, we don’t want to truly ‘rough it’, but also keep it in line with the overall feeling of the space. Kitchen Ceilings: Don't be shy about looking up. Even small changes to the area above your head will boost your kitchen's look. Beams are wonderful but bead board can also do amazing things. Don't forget about trim, trim and more trim to finish it off. Rustic Kitchen Accessories: There are to many to list! Everything from paper towel holders, blackboards, wire baskets, milk jugs, outlet covers, and shelving can become the little touches with the big impacts! Check out our idea board for more of the brightest and best in kitchen decor from around the web! Follow Bill Pearn Masonry's board Rustic Kitchens on Pinterest.